This maple leaves tattoo was supposed to be a lower half sleeve at first but later turned out into something a bit bigger. The soulder left clean in purpouse, it was my clien't idea from the very beginning, very strange one, I must say. As far as I got every leaf or flower means something for him since he knew exactly how this or that should look, were placed etc. I freehanded all this tattoo. It took me about 27 hours in 6 sessions. 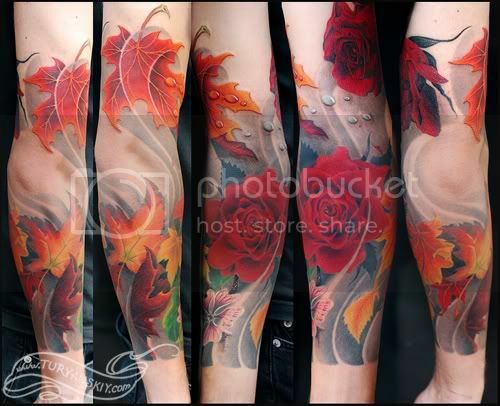 Enjoyed working on this maple leaves tattoo sleeve a lot. The bigger version and rose zoom are available in my Tattoo Gallery as always.